Financial services organisations are reducing the amount of commercial office space they require as they adopt more flexible work styles. This is according to a new report from HOK’s US team, The New Financial Workplace, an investigation into the threats and challenges facing the financial services industry, with a special focus on how new technologies like cryptocurrency, biometrics and blockchain are disrupting the sector. Financial services companies are being challenged by the emerging fintech industry, says the report, which is projected to grow to $8 billion in 2018. These traditional companies must adopt the cultures and workplace design practices of the technology industry to stay ahead. The 36-page report explores the “talent imperative”—the need for these financial companies to use their space to attract the best people. Also included are key takeaways from HOK’s recent global workplace survey of corporate real estate executives in the financial industry. 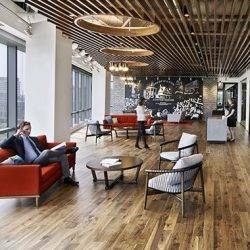 Also included are key takeaways from HOK’s recent global survey of corporate real estate executives, which indicate that 85 percent have global workplace programs, 66 percent have formal distributed work programs (monitoring and tracking space utilization), 84 percent lease space and 90 percent use some form of free addressing, unassigned space. A continued decline in square footage across the industry indicates that more financial firms have adopted progressive work styles and are catching up with early adopters. Firms that had previously reduced their space have stabilized and are now looking for ways to enhance the employee experience and retain top talent. Office space has evolved from being the only place of work to one of many in an entire ecosystem of choices. Firms are moving beyond open-plan offices and instead installing more flexible space. Neighborhood-based Choice Environments (NCE) provide neighborhoods for teams to operate out of while still giving people access to a variety of work settings. Financial companies will likely seek more M&A activities to expand their services, product offerings and expertise. The report also includes case studies of projects for leading financial services firms Scotiabank, TD, Nasdaq, Union Bank and Harris Bank that provide insight into current best practices. You can access a link to download a PDF of the report here.